Life With The Speeds: Panto at the Pavillion - Oh no it isn't! Panto at the Pavillion - Oh no it isn't! Last week the girls and I got a chance to enjoy the pantomime at The Pavilion Theatre, Gorleston and what a lovely way it was to kick off our seasonal celebrations! 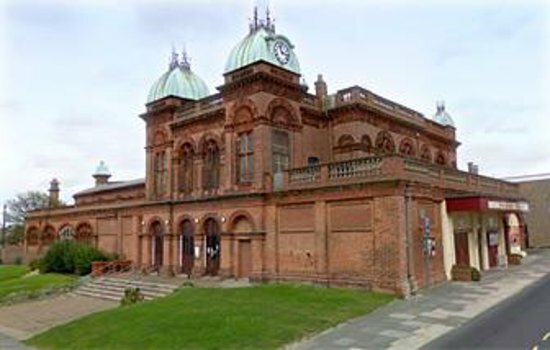 The Pavilion Theatre is over all year round and is situated right next to Gorleston's stunning beach and stands out with its Edwardian red brick, topped with green copper cupolas. The theatre seats 300 and was built in 1901, today the original building still stands in its entirety having avoided damaged during the wars. 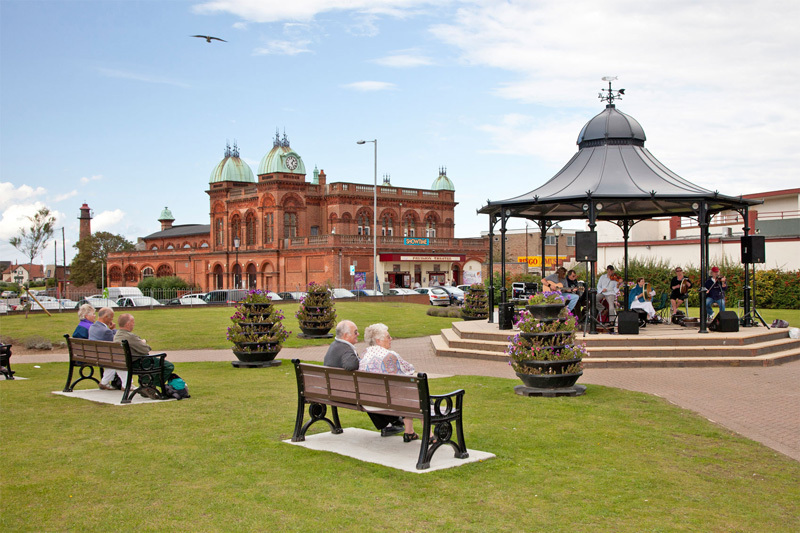 The theatre overlooks the gardens on the lower prom in which the Gorleston Bandstand takes centre stage. As you enter the building you find the Box Office immediately ahead, the walls are full of memorabilia of bygone days. This theatre has a rich history and they proudly display this for visitors. Instead of rows of seating, the Auditorium is set out with tables and chairs making it comfortable for those with drinks and snacks. Inside it is beautifully adorned with carved wood, heavy red curtains and gold trim, giving the theatre an opulent feeling. Each year The Pavilion hosts a popular Pantomime, starring radio and television presenter Helen McDermott, this year's panto is Aladdin. The panto is a fast moving, lively and fun-packed show, packed with slapstick comedy for the whole family and innuendos to give the adults a chuckle! The characters are brightly adorned with the usual mix up of genders playing parts. Helen McDermott opens the show as a stagehand who finds herself suddenly standing in as The Slave of the Ring, as she rushes off stage to get ready the curtains open to reveal Abanazar, cue boos and jeers from the audience. Next we meet Wishee Washee, Aladdin's older brother. He adds a fun element who the children warm to. He also introduces the audience to the vibrant, larger-than-life Widow Twankee! Onto the stage bursts Widow Twankee is full Panto Dame regalia! From here-on the laughs come thick and fast. Shortly Aladdin makes his first appearance, running from the police and uses his mother "ample" figure to hide behind. Soon he is telling the audience that he has fallen in love, with the Princess! The show goes on, full of laughs, dancing and songs. As the story unfolds we find out that the Princess herself has seen Aladdin and fallen in love with him. However, her parents insist that a Princess can only marry a man of money and title. Meanwhile, Abanazar has discovered he must find the magic lantern from a cave, he needs to find a young man to help him and happens upon Widow Twankee, she uses her womanly virtues to try and seduce him but he sees this as a means to get her young son, Aladdin to retrieve the lantern. Once Aladdin is in the cave he is able to gather jewels and gold, hoping that he can win the Kings approval to marry Jasmine, deciding not to give Abanazar the lantern, he finds himself locked into the cave. But with the help of the audience he decides to rub the lantern and with a puff of smoke, the Genie appears. He is able to grant Aladdin's every desire, firstly being freed from the cave. Now he has riches and the Genie grants him a title, now he is able to marry the Princess. But Abanazar isn't about to give up, he tricks Jasmine into giving him the lantern and takes it and her to Eygpt. Hotfooted by Aladdin, his plan is foiled and the pair reunited. By the end of the Panto we have laughed so much that my tummy hurts and we leave with songs stuck in our heads and ready for the Christmas Season. 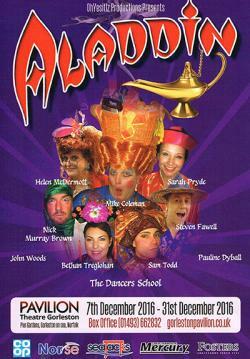 The Panto runs now until the 31st December so make sure you book soon. Full details can be found here. 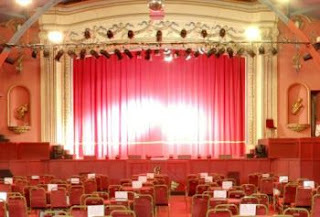 The Pavilion Theatre also offers a Panto just for adults! Jack and his Big Stalk! I've not been to one of these but have heard great reviews. Unfortunately for us this has already sold out this year but be sure to look early next year so you don't miss out. We have another Panto booked, our now Christmas Eve tradition, which we are very much looking forward to.